IBP-1504 supports 4 video and 4 audio channels. 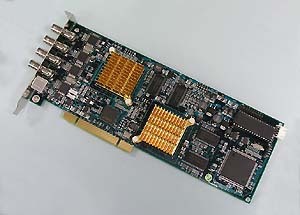 For video with Leading-edge technology of MJPEG hardware compression chips, it can reach Real-time performance in playback, also with a monitoring display resolution at 640x480 for NTSC. The build-in voice chips help to record voice data at the same speed of video recording. These Features: guarantee the quality of recorded images and sound in playback to be "what you see/hear and what you got" performance. This capture card is developed with "Image contract", "Separation of front and back image", and "Recording when movement detected" techniques, built internally for separating motion objects and the compression process, in order to increase the speed and quality for encoding and decoding; these also effectively extend the total recording time with a more compact HDD/SSD space requirement. For PTZ and Speed Dome camera support, users can control most of the camera's functions such as the lens movement of up, down, right, left, turn, or in focus. Also, it can have the Iris control, the screen Zoom IN/OUT, Preset of the Point, the Cruise, and the Auto-pan. Beside the above, to support the I/O control feature, the board also provides 8 I/O ports connection for any alarm device or detective equipment. Support Direct control of the Dome camera to move up, down, left, right, zoom in/out, iris and focus, preset point setting and control, auto-pan and the cruise function. When alarm triggered, voice messages can be sent to preset telephone/mobile, or to send the images to designated email users. Live Video/Audio Support live monitoring or remote access of video and audio. Authorization setting System supervisor can set authorization in control of the system protection. Recording, playback, remote monitoring, and local viewing at the same time. Printing Function Snapshot with date, time, place, and camera name. Provide search by alarm-trigger tag. All video data files are saved and managed in order of Time/Date. Backup with HDD/RAID, DVD-RAM/RW, CD-RW, DAT, and MO devices. Provide play, stop, clip, dragging, and fast/slow playback functions. Connect to remote systems through TCP/IP. Remote Live Image Remote access and record the live image from the other host system. Remote Control To remote control PTZ, I/O port and to set the remote alarm detective area, recording snapshot, activate or disable the alarm. SDK-1504 - Software Development Kit is available to customize your own DVR applications. Please contact us for the SDK.